One of the oldest online casinos, River Belle has been doing business since it opened its virtual doors in the distant 1997 and has been one of the most respected Microgaming casinos ever since. As all Microgaming online casinos, River Belle does not allow US players top open accounts and play, but Canada, UK and all EU countries re welcome. It offers the full suite of Microgaming video slots, including the famous progressive jackpots, which have made many a players millionaires in an instant. Microgaming software is arguably offering the best video slots of any online casino and River Belle has them all, including the very latest blockbusters like Thunderstruck and Dark Night series of reality video slots. Depositing options and withdrawal methods are plenty here and the payouts are processed and sent to the player within 24 hours. The reason we have given River Belle a lower rating is that the bonus is considerably small, even for a Microgaming casino. At just 200 free chips in your preferred currency, there are better bonus deal out there from the Microgaming casinos, for example Lucky Nugget. 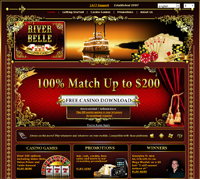 Still, if you are not after a big bonus and want to play the latest video slots, River Belle is a top-notch casino.